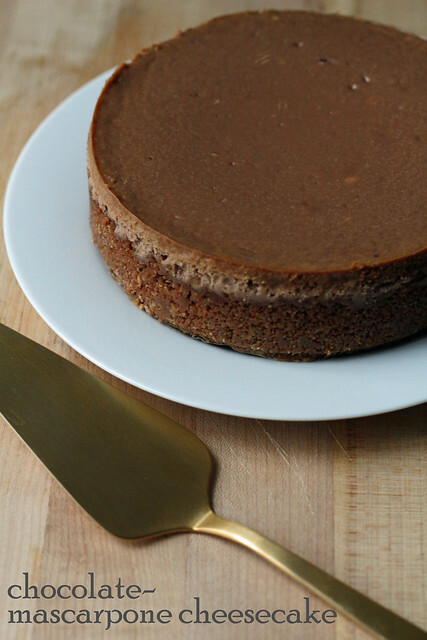 I wouldn’t want to eat David Ogonowski’s Chocolate Mascarpone Cheesecake in any type of weather other than the type we’ve been having (i.e., “two blizzards a week” weather). It’s true hibernation food…if you told me it was a thousand calories a slice, I wouldn’t be surprised. This is a dense and creamy cheesecake with cream cheese, of course, mascarpone and sour cream. Oh, and there’s chocolate, too, although frankly it gets a little lost in all the dairy. Adding a dark chocolate ganache layer on top of the cooled cake is an option, but might send this cake over the top. The recipe doesn’t call for a crust. Well, actually, it calls for baking the cheesecake without a crust and then patting cookie crumbs onto the bottom and sides once it’s set. My inner baker’s voice told me that was weird and that I’d probably have some sort of disaster in the process, so I went ahead and made a real crust for mine. I had a baggie of homemade chocolate-hazelnut cookie crumbs in the freezer that need to be used up (and I love crumb crusts!) anyway. Also, I’ve always liked making my cheesecake batter in the food processor rather than in a stand mixer. Faster mixing and fewer lumps. For the recipe, see Baking with Julia by Dorie Greenspan. Don’t forget to check out the rest of the TWD Blogroll! i love chocolate and mascarpone !!! Your cheesecake is picture perfect! it looks so yummy and perfect! chocolate hazelnut cookie crumbs? yum! Ermagawd this has everything that I love. It’s sheer perfection! Hi Stephanie. How did you manage the perfect and smooth “top” like that? Thanks! I’m not entirely sure this is why, but I think that making my batter in the food processor incorporated less air into it than making it in a mixer would have, so the cake didn’t soufflé in the oven and later fall and crack. Also a water bath helps with gentle baking. Looks so lovely – and I adore the choc & hazelnut base. I’d be interested how the original version of patting on the crumbs fared but think I’d have gone for your option – sounds easier! That looks like a thousand calories! this looks really yum, I love cheesecakes! I was going to say picture perfect, when I saw the picture, but I see someone has beaten me to it :-). Your cheesecake looks great. Beautiful! Seems like most people opted to make the crust first. Might not be per recipe, but something tells me the whole flipping and patting might lead to a big mass of mushed up cheesecake and then where would we be? I agree that the chocolate flavor was a bit lost. Your cake looks wonderful with the crust! I made the crust too, looks amazing! Looks beautiful and I know it tasted even better! This was a big hit in my house! I loved that it was not overly sweet. Creamy goodness. I agree with you regarding the chocolate-ness being a bit lost among all that smooth cheesecake perfection though. Your cheesecake looks stunning! I added a crumb crust beforehand as well. No way was I doing any flipping of any kind. Like you said, weird. Wow. This looks fantastic. Perfect crust. I look forward to exploring your blog some more. Emma. I added an extra ounce of chocolate to my recipe. It probably made it denser, but my chocolate flavor was pretty good. I also baked a crust in the pan first. No flipping for me. Adding a dark chocolate ganache layer on top helped bring out the chocolate flavor. Hibernation mode!